What I mean by this is do these different activities exist in isolation, or do they work together to help build momentum and interest around your organisation? You can probably guess what I would advocate; we find that the most effective marketing approach for these digital tools is to join the dots. 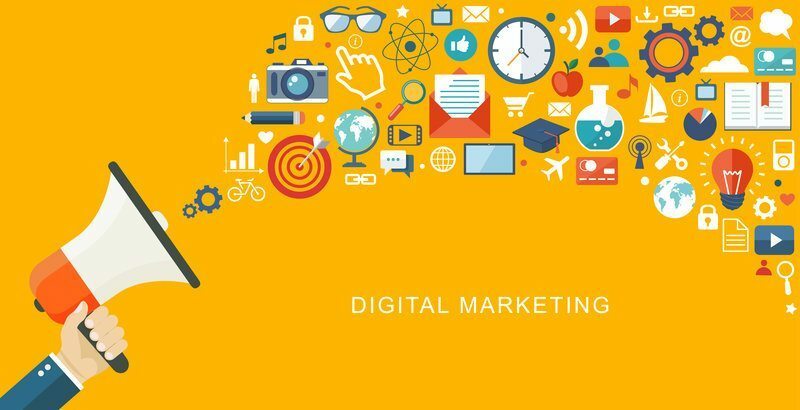 WHAT IS JOINED UP DIGITAL MARKETING? Content you share on social media, your company blog and through email campaigns is generally designed to build relationships with your customers, engage them without selling, establish your brand and expert reputation, and ask them to take the next step in your sales funnel. This next step will vary depending on the platform, for example a social media update could highlight something topical in the news with a link to a relevant blog post that explores that subject in more depth. The blog post then engages the prospect further and directs readers to an email signup (perhaps involving a free download or other incentive to capture email addresses). Then you can target prospects more directly using email campaigns – sending them relevant content, offers or highlighting relevant products or services. Alternatively your email campaign could provide a link to a relevant blog post, and the blog post itself takes them further down your sales funnel. For example by pointing them in the direction of a case study that helps to validate what your organisation does, and then to a more direct CTA to buy a product or make an enquiry. Another key factor in successful digital marketing is consistency; ensuring that whatever platform your prospects are on, your message is consistent so they know exactly who you are and what to expect. That means that if you are talking about a particular subject a lot on social media, you should also have something to say about it on your blog and cross reference it in emails too. It’s about building your authority and reputation as the company who understands that particular subject or area of interest. So if you’re planning a targeted marketing campaign such as an email campaign aimed at a particular customer avatar, perhaps focusing on selling a specific product or service, it can be really beneficial to ensure you join the dots across other platforms too. Overview: A web design business has acquired a list of small businesses they wish to target with their web-hosting service. This service is a small part of their overall web offering but one they wish to expand on and that will enable them to upsell other services. Challenge: They design an email campaign to support this but before sending they look at their other platforms. Their social media platforms and blog focus heavily on content that supports other services; if a prospect visited them they wouldn’t necessarily understand the link between this content and web-hosting. Apart from their service pages on their website, there is no other content that relates specifically to web-hosting. Solution: Before sending the email campaign the company develop a strategy to populate their social media platforms and blog with more relevant content for their target audience. This includes disruptive content sharing facts and figures about issues with web-hosting (such as 123-reg accidentally deleting customers’ sites), checklists and top-of-the-sales-funnel content around choosing a web-hosting service, case studies demonstrating how they have helped existing customers with their hosting solution and further content that reinforces their expertise in this area. Expected result: We have seen with our clients that when there’s consistency across different platforms around a specific campaign, they get much better results. Prospects know they’re in the right place when they visit a website from a link in an email or when they check out the organisation on social media. We see spikes in visits to relevant blog posts, and more engagement on social media with posts related to the campaign, ultimately increasing conversions and leading to more enquiries and sales. These digital marketing strategies are easy to implement whatever the size of your business and result in much more effective and focused campaigns. If you have any questions about this or would like to discuss your organisation’s digital marketing, please give me a call at Stop and Stare Marketing on 01252 717373 or email hello@stopandstaremarketing.co.uk.